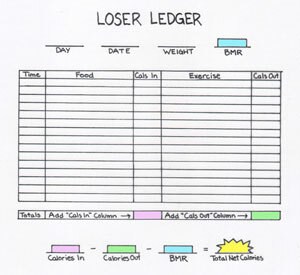 As promised in the book, you can download your own Loser Ledger here to get started. Your Basal Metabolic Rate. This is the amount of calories your body automatically burns every day, just living, just existing, just laying in bed and watching Wild Hogs. Oops! We're missing some information - please fill it out so we can calculate your BMR correctly. There you have it! Your BMR! Your Net Worth! Congratulations! Now plug it into the Equation of Equations of Equations and budget your bulge away! Don't know what I'm talking about? Buy the book! Get moving! 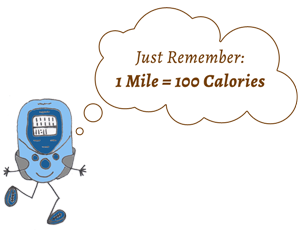 MyFitnessPal can clue you in to how many calories you're burning at a time. Do you need to know how many calories are in something you're about to eat or have already eaten? Check it out with our food search. Just type in the name of the food you're looking for (for example: Apple) and click the search button. It can take a moment for our database scan, so please be patient! Your search results will show below. Click a food name for the Nutrition Facts label.